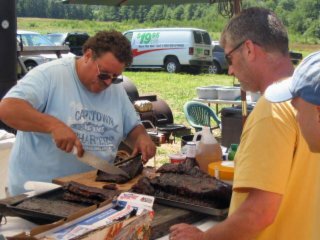 New England's top BBQ specialists converged on Zach's Farm in York, not far from the New Hampshire border for the 2nd Annual Great State of Maine Barbeque and Grilling Championship. 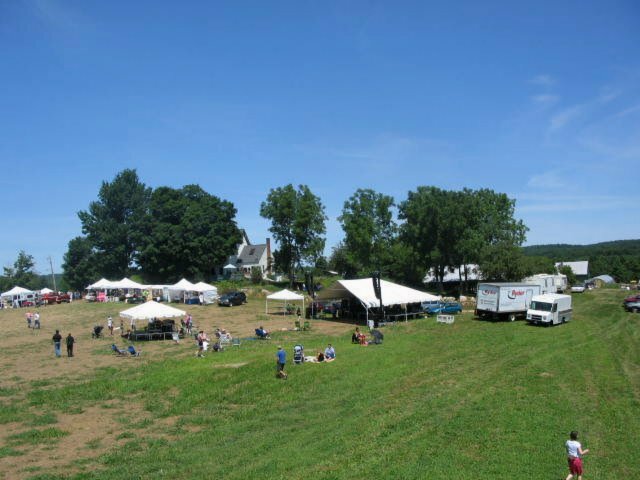 In between was a vast beer tent supplied all weekend by Portland Microbrewer Gritty McDuff's. 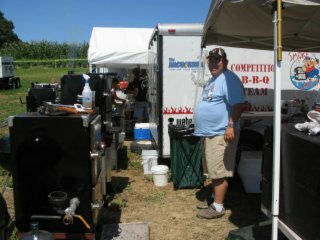 Saturday's competition was grilling specialties - today was the 'Q which was divided into Chicken, Pulled Pork, Ribs, Brisket and a chef's choice which had to include 50% lobster. This is Ted Aggeler from Kansas City. He's a project manager in Connecticut at the moment. He and his wife couldn't resist entering the competition. 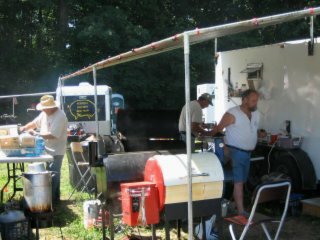 These guys from Norwich, Conn - like a lot of the contestants - had a styling camper that fit all the gear and three people. 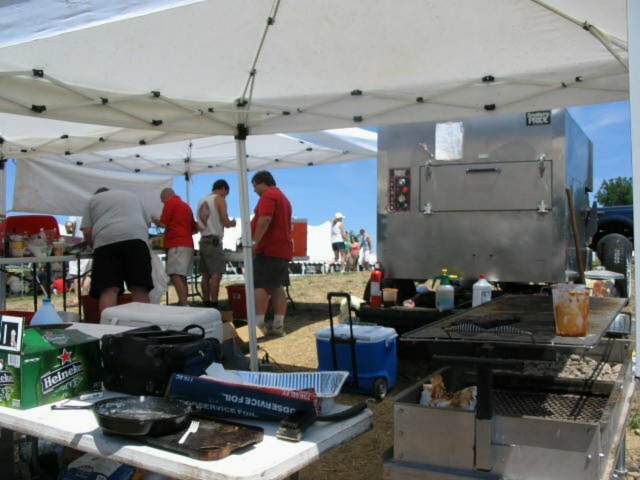 At the judges tent, entries were considered on appearance. 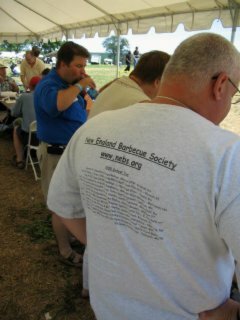 I never knew there was a New England Barbeque Society. 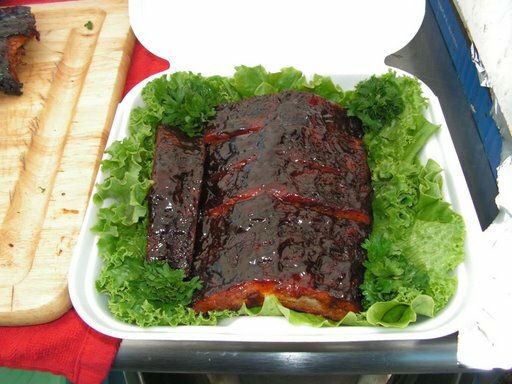 I realized that a couple people cooked six or so racks with a slightly different rub mixture or finishing sauce strategy, then picked the best one for the entry. And a close eye is kept on the results. 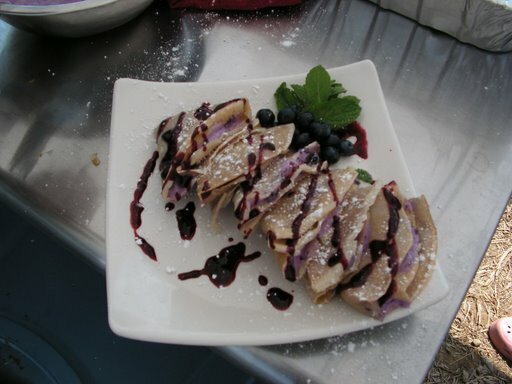 Outstanding - and delicious. You better believe I got samples! We left before the winner was declared but were promised a detail on Tuesday. A great time was made better by a variety of good bands. I encourage all near and far to check it out next year. It was great meeting you at the competition John. 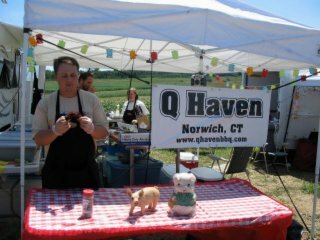 If you would like to see more pictures from the event, including all of our turn in boxes from the grilling and BBQ competitions, click the link below, or visit our web site at www.qhavenbbq.com. 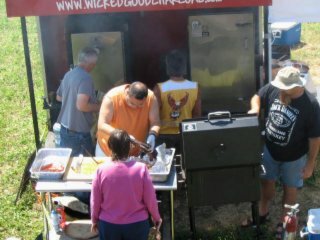 For all you New Yorkers out there, the biggest BBQ compeition and festival in the Northeast will be held in less than two weeks in New Paltz, NY. There are more than 60 teams will be competing. If you attend, be sure to stop by our site and say hi! You are so fantastic to provide us with such a fine report, complete with pictures! 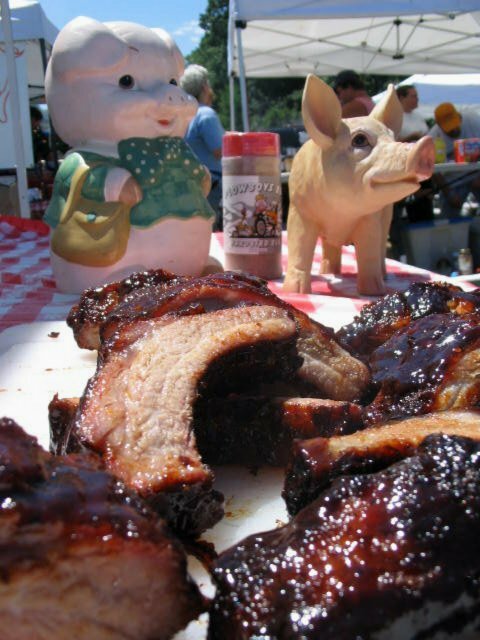 The food looks so freakin' good, I can't believe we haven't even gotten around to firing up our smoker yet this summer. I thought I had read that the visitors are not able to eat the competition food due to some health codes or something. Is that true? Seems like a rather torturous event to attend if that is the case. 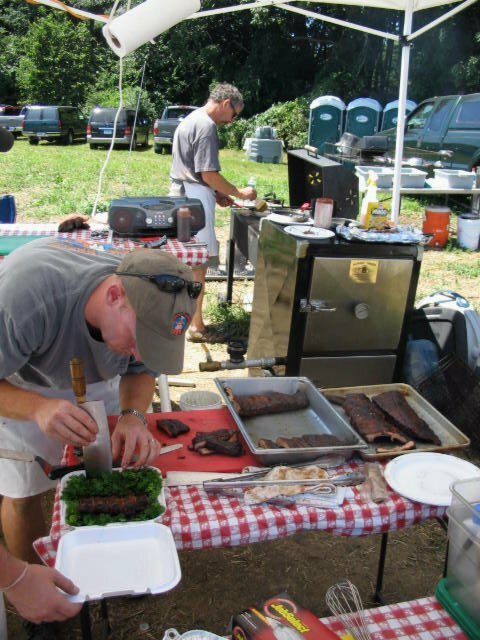 What are the defining characteristics of New England BBQ? It appears similar to the Carolinas style, though perhaps a bit more eclectic. I think that the bulk of the contestants were purveyors of other regional 'cues. 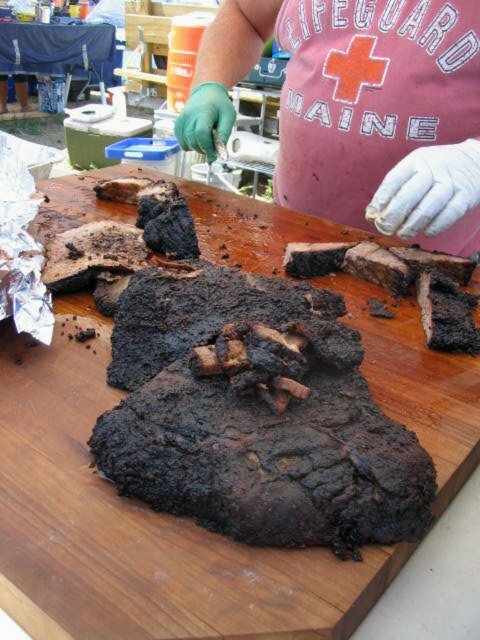 That wicked brisket ain't indigenous Maine, no sir. 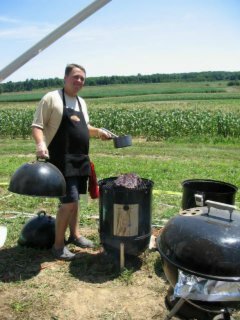 I believe the New England Barbecue Society's contests are conducted using the Kansas City Barbeque Society's rules and regulations. 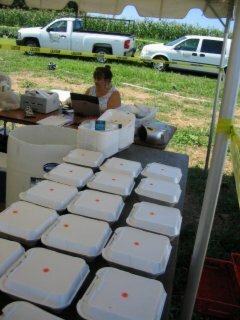 Those are KCBS judging forms in the photos. 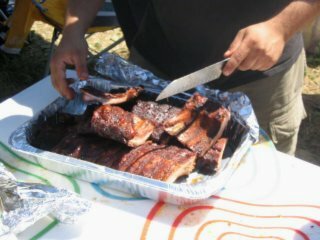 One of johnnyd's photo-captions says, "The judges argue merits of rib entries..." This might be a tad misleading. 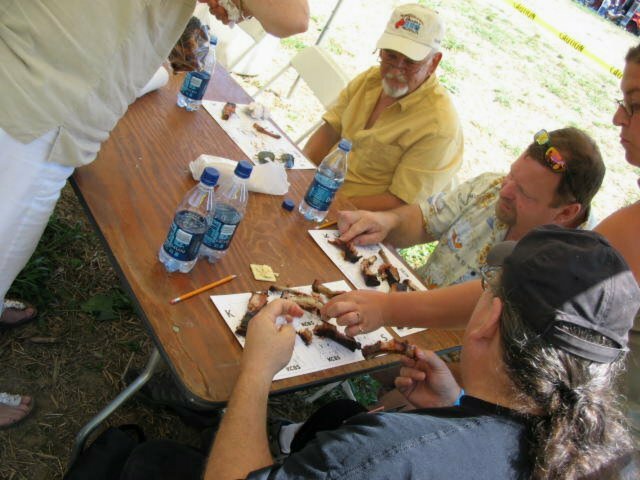 The judges do not confer amongst themselves until everyone has finished scoring the entries on their own. At your judging table, "No discussion with other judges when judging. When all slips have been turned in, you may talk quietly; remember, others may still be judging." 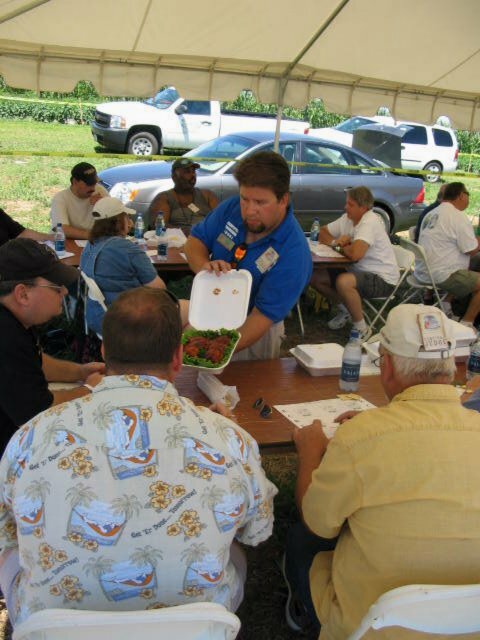 The KCBS runs classes to become certified judges. 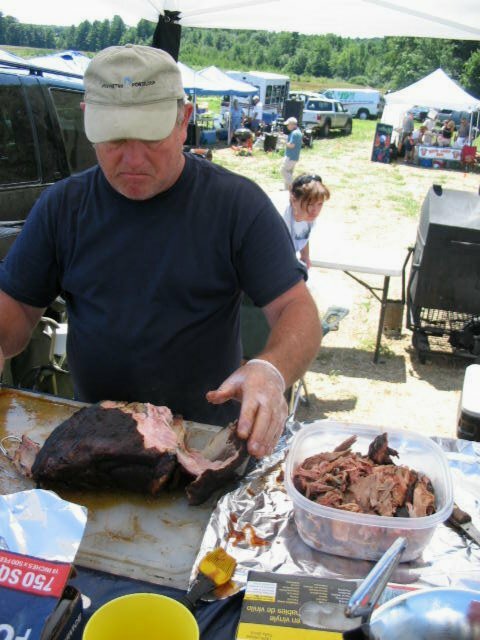 Get certified and volunteer to judge at any KCBS sanctioned contest. 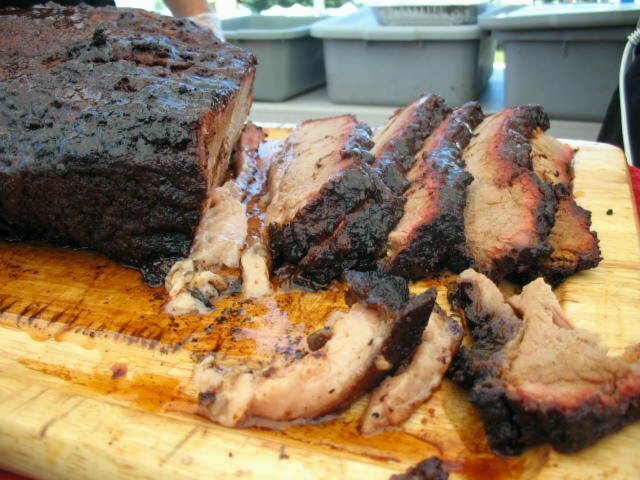 Time to buy that motorhome and hit the road for some 'cue? 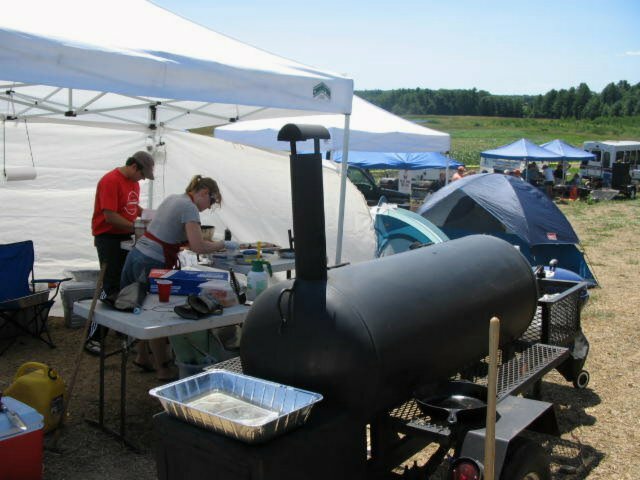 Current KCBS instructions for judges. I couldn't help but notice the girth of the judges I'm sure they love their jobs! 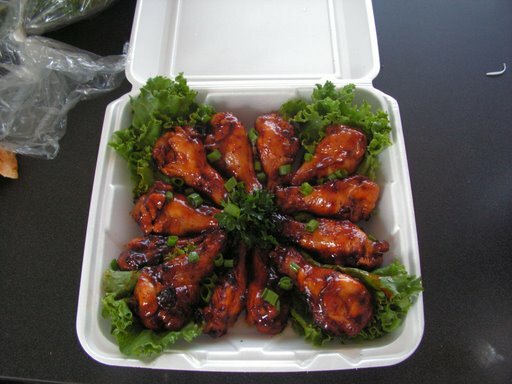 I continue to be fascinated by regional styles of BBQ. Coming from the midwest, I'm so attached to sloppin' sauce covering my pork (no beef), and now I live in a town that doesn't even know what sauce is. 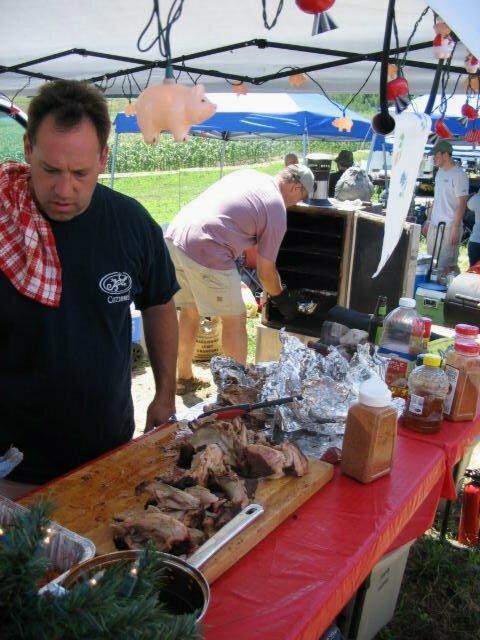 St. Louisans will appreciate this little jingle, "What makes that Q a culinary thrill? You gotta Maul it! Spread that great sauce on. You gotta Maul it!" 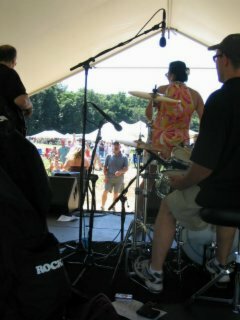 Anyway, thanks for the report JohnnyD and welcome to the forum Tedlor70. Thank you for the clarification, BB. They must have finished because there was a lot of opinion being thrown around when I snapped that pic; "this one was too charred - I couldn't taste it," and "too much fat/sugar/sauce on this one," and "this one was the best thing I've had all weekend," rang a lot of bells. Hey, Tedlor70 from Norwich! Glad you joined in. Do you have a list of winners in all, or some, categories? 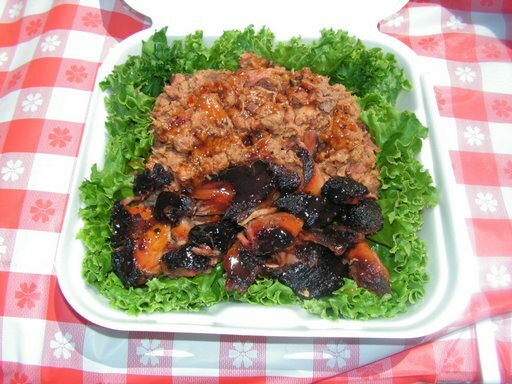 the BBQME website hasn't been updated with the winners yet. 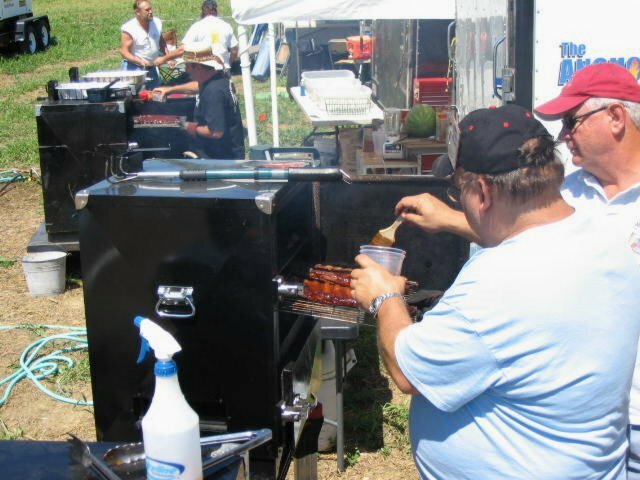 There actually was plenty of BBQ and other food for sale away from the contestants but if you took the initiative to go visit the competitors they were eager to offer samples to anyone who showed an interest. 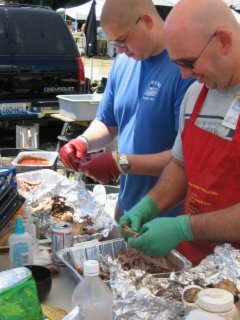 There were exceptions - a couple guys were all business and focused entirely on their entries - "No talking, please!" 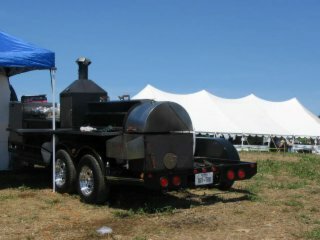 - but after all entries were in, there were buckets of awesome brisket and pulled pork in trays at every table. I was border-line 'Q-coma, man. Reserve - I Smell Smoke!!! 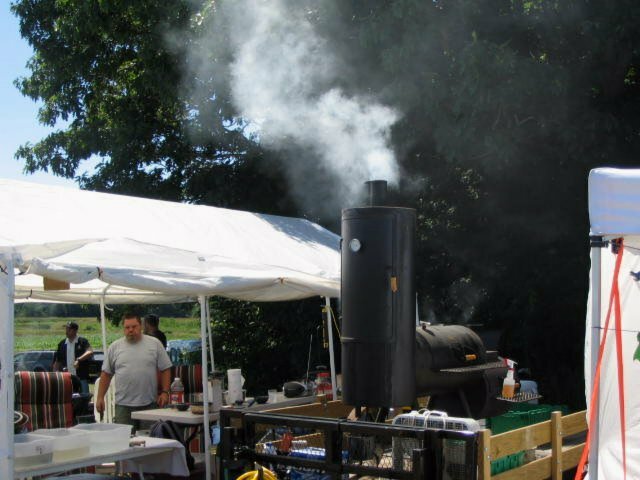 Grand - I Smell Smoke!!! 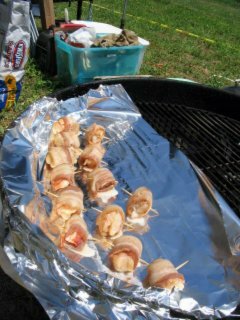 The first rib picture, the 2nd brisket picture and the bacon wrapped lobster picture above were all ours. I'm most proud of the 1st place steak! 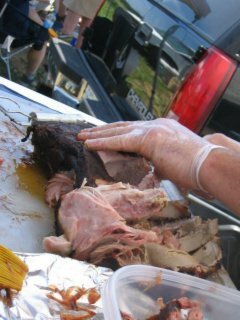 We didn't fare well in the BBQ competition. 6th overall out of 21 teams, but finished out of the $$ in all categories. 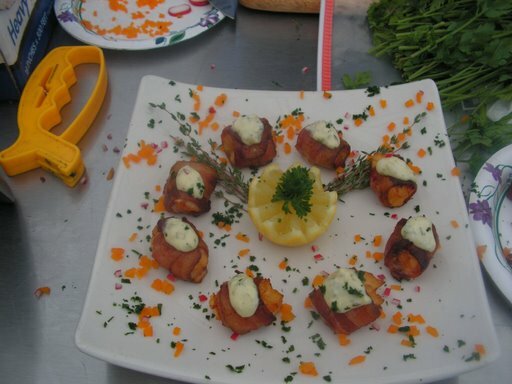 Bacon Wrapped Lobster, 14th place (hard to compete with teams turning in 6 baked stuffed tails! Oh, Baby! 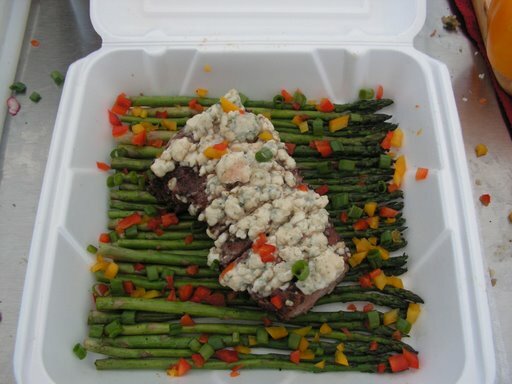 That's some great looking food. You're making me wish I'd come down Saturday as well. 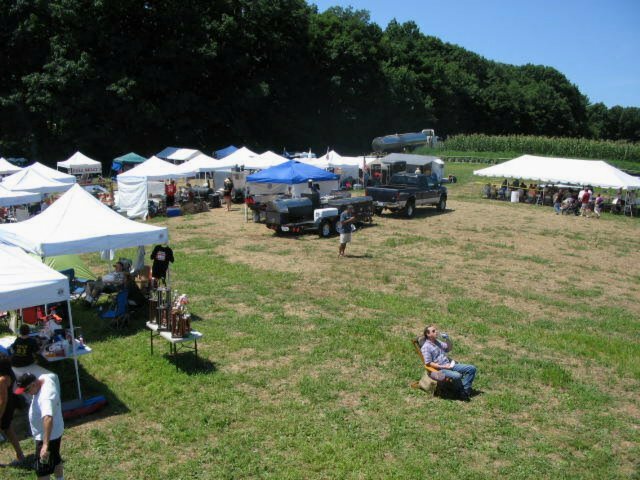 Maybe I'll bring a tent next year?